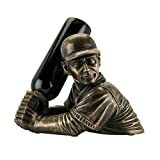 Keep your next bottle of wine in the batter's box ready to go with this cool new Baseball Bat Wine Bottle Holder. 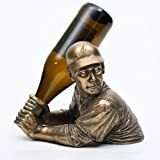 Just insert a wine bottle or other bottle of spirits by the neck into the baseball player's grip, step back, and admire the cleverness of this fun wine bottle holder. Yep, the wine bottle is now a baseball bat. Genius.